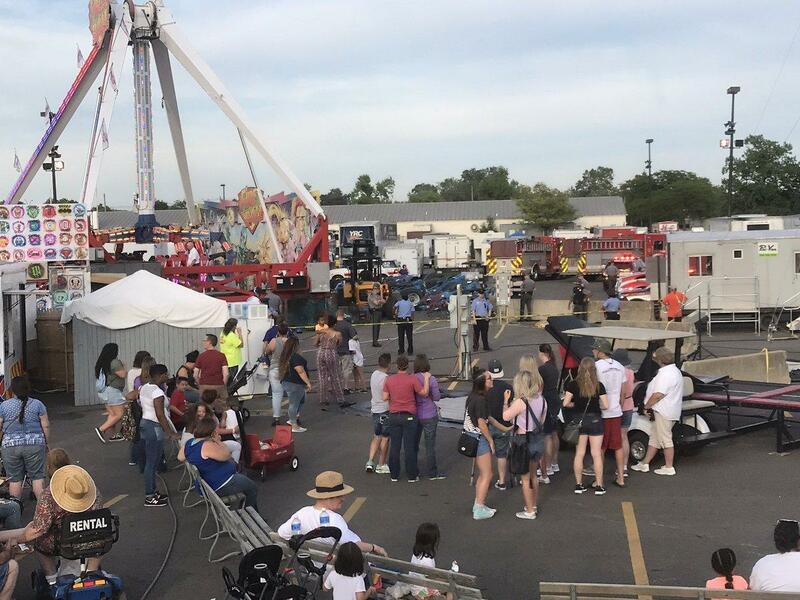 One man was killed and several others were injured when a ride malfunctioned at the Ohio State Fair on Wednesday, according to authorities. CBS affiliate WBNS-TV reports that five of the injured were listed in critical condition; the other two were in stable condition. Officials with the Ohio Department of Agriculture identified the ride as the "Fire Ball" -- which a company that provides rides for the fair describes as being an "aggressive thrill" ride, The Associated Press reports. Dramatic video was captured by an eyewitness that shows the ride swinging back and forth like a pendulum and spinning in the air when it crashes into something and part of the ride flies off, throwing riders to the ground. The Ohio State Fair confirmed the incident in a post on Twitter and later released a statement saying "our hearts are heavy for the families of those involved." Some of the victims were thrown from the ride, Columbus Battalion Chief Steve Martin said. Dr. David C. Evans, Trauma Medical Director at The Ohio State University, addressed the media Wednesday night to say they are evaluating three patients at the hospital. He indicated that the injured suffered wounds after being ejected from the ride at a high rate of speed. He also said they were in the process of notifying family members and that the patients could expect to stay in the hospital for up to a week. Col. Paul Pride, Superintendent of the Ohio State Highway Patrol, confirmed that just after 7 p.m. local time an incident occurred that left one person dead and three critically injured. Director of the Ohio Department of Agriculture David Daniels expressed his condolences and vowed there would be a "complete review of all the rides" at the fair. The state fair was to reopen on Thursday, officials said, but the rides wouldn't be running until they all are determined to be safe. Ohio Gov. John Kasich also addressed the "terrible, terrible tragedy" Wednesday night. "It's a very, very tough situation when you go somewhere to have a great time ... the fair is about the best things in life ... and with this accident it becomes a terrible tragedy." Kasich said all the rides were shut down and said the ride in question was inspected multiple times before the fair's opening. "We will get to the bottom of this ... there will be complete transparency," Kasich added. Documents would be released on inspection records for the "Fire Ball." "This is a very, very sad night for all of us," Kasich added. Earlier, Gov. Kasich released a statement on Twitter saying that he is "terribly saddened by this accident, by this loss of life and that people were injured." The Ohio State Fair kicked off Wednesday and was supposed to run through August 6, according to its website. Michael Vartorella, the Ohio Department of Agriculture Chief Ride Inspector, said that there were "no red flags on this ride through the inspection process" and provided "no detail about what specifically malfunctioned on this ride at this point." Daniels mentioned in the press conference Wednesday night that they started out the day with 11 rides that didn't open because the inspection work wasn't complete -- and that four rides won't operate because they do not meet the mechanical test. Ohio officials say the ride was owned and operated by a company called Amusements of America based in New Jersey. On its website, the company states that since its debut in 2002, the Fire Ball has become "one of the most popular thrill rides on the AOA Midway." The Associated Press cites the company description of the ride as swinging riders 40 feet above the midway while spinning them at 13 revolutions per minute. There was no immediate information about the ages or identities of those involved. Jane and I send our prayers and deepest sympathies to all those who were impacted by the accident at the Ohio State Fair this evening.